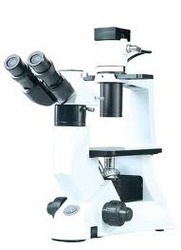 We bring forth an extensive range of Biological Microscopes for our invaluable and prestigious clients. The use of these products provide versatility and high quality images for bright field & phase contrast observation. 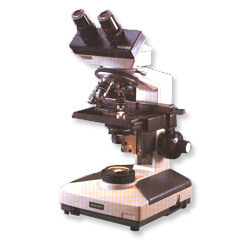 Laboratory Biological Microscope was produced with excellent optical system to supply clearer image. Compact all-in-one structure design makes operation easier. Ergonomic design were applied on whole unit, the working stage, coarse & fine focusing system, and brightness adjusting knob are all in same low position, highly improved operating comfort and convenient. Inverted Microscope is used for identification and analysis of the structures of the structures of different metals and alloys. 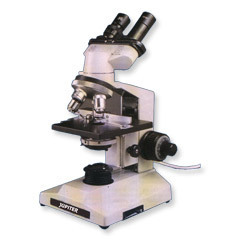 Inverted microscope is an important instrument for researching metallographic in metal physics. Inverted microscope can be used learning for molding, smelting, heat treatment examination and scientific research, colleges and factory. 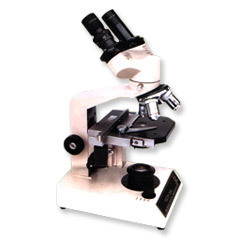 Inverted Microscopes and Inverted Biological Microscopes have various useful models. We design and manufacture microscopes for pathological and micro biological works. 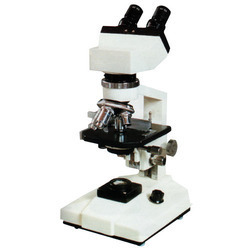 These microscopes are available in various magnifying powers and are easy to handle. 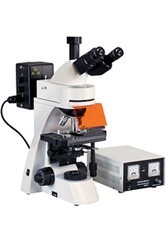 Provided with various attached accessories these microscopes are durable and can function efficiently. These microscopes find their usage in Pathological and Micro Biological Works. All our microscopes are designed with attention to intricate details so that they are according to the industrial needs as well as the purpose they are meant for. These microscopes are also easily affordable. We manufacture Biolux microscopes which are used for Pathological and Micro Biological Works. These microscopes can easily conduct minute studies and provide accurate results. 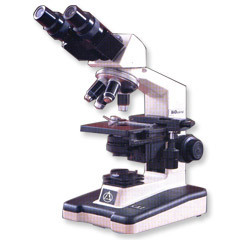 These microscopes have high magnifying power and are widely used in research labs as well as medical institutes. We are leading manufacturer of bio series microscopes. These are made using quality components such as lenses. Available with adjustable angles, these are offered at industry leading prices to our clients. These microscopes are designed as per the industrial usage and have high magnifying as well as detecting power. 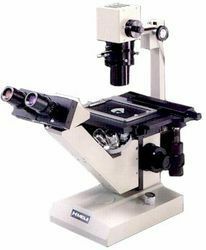 We offer binocular microscope which is attached with a camera for capturing the image of the product being viewed or studied. 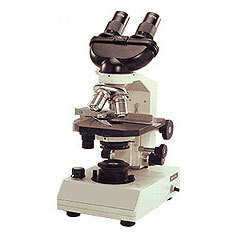 This microscope is generally used in research labs for in depth study and analysis of the subject. 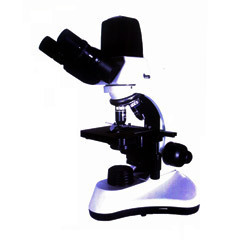 The resolutions of this microscope can be adjusted as per the requirement in order to get a perfect view. This microscope uses refractive lenses that are made of glass or plastic to focus light into the eye or another light detector. With high magnifying resolution this microscope has an insurmountable diffraction limit. 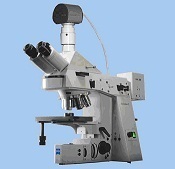 This microscope can easily be installed and is used for several acute research purposes. We are the leading Supplier Fluorescence Stereo Microscope. Our product range also comprises of Fluorescent Microscope. 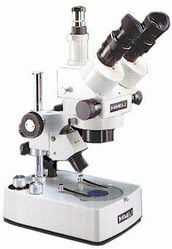 The student stereo microscope has been especially designed for dissection/inspection of specimens in Biology as it has long working distance objectives & wide field eyepieces that give an extremely large, brilliant & bright image. The set is available in wooden storing cabinet at an affordable price. Stand : Stable and Robust, assembled from Aluminium DIE-CAST parts. Body : Monocular Tube inclinable upto 90 Mechanical Tube length 160 mm. Stage : Fixed square stage size 120 x 120 mm with stage Clips. Nosepiece : Triple revolving nose piece with positive centring &click stops. Condenser : Fixed Condenser (N.A. 1.2) with Iris diaphragm & filter holder. Focussing : By vertical movement of body tube, coarse adjustment by rack-pinion movement and fine by screw lever mechanism. Safety Device : Adjustable down stopper for preventing accidental damage to slides. Illumination : Plano- Concave Mirror diameter 50mm gimble mount. Objectives : Achromatic 10X and 40X Eyepieces : Huy.5X, 10X, 15X (Any Two) or Wide field 10X. Accessories : Vinyl Cover, Duster, Cleaning Brush, Filter & Operating Manual. Packing : In full mould Styrofoam/ Thermocol Container. Optional Accessories : Mechanical Stage, Wooden Storing Cabinet with Lock and Key, Draw Tube, Spare Objectives, Sub-Stage 20W Lamp for 220/ 110V. Looking for Biological Microscope ?